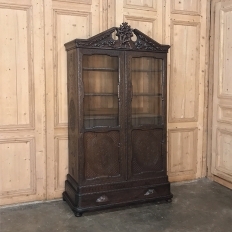 Since antique bookcases are far more rare and antique vitrines and curio cabinets are considerably smaller, we choose selected antique armoires to convert into display cases, using our own in-house talented artisans. This gives you a much wider selection of beautiful ways to display your finest collection or most cherished family heirlooms. The antique display armoire is a stunning way to create a truly personal touch to that special room.